Of all the edible greens available, Moringa is my favorite, hands down. Compared to lettuce, spinach, kale, mustard greens - whatever greens you like to eat - Moringa is the King of them all - well - at least I think it is! Admittedly, there is a lot of scientific research available to substantiate Moringa's nutritional benefits: ultimately, my taste buds and Moringa's effect on my body are all the science and truth I need. 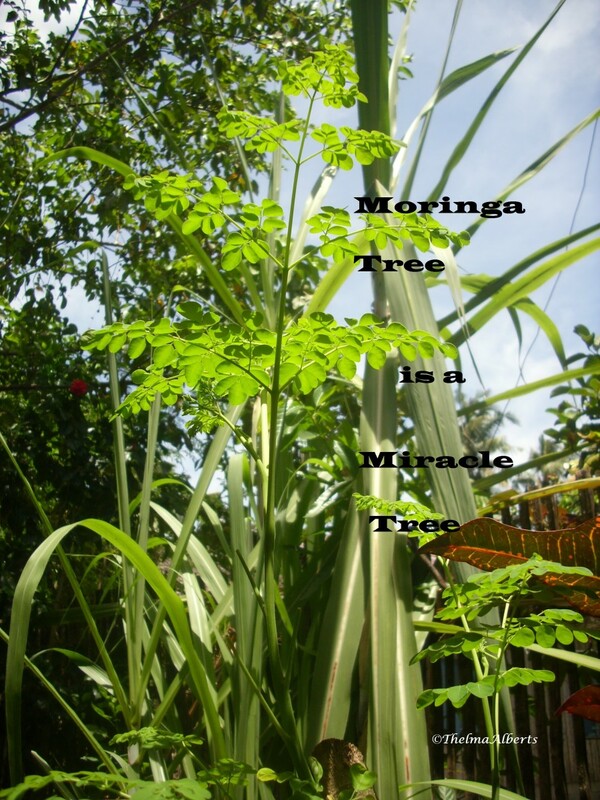 I came across the incredible Moringa tree, when I was investigating edible landscaping for our family. We had already planted a lot of other things that grow well in the southern US, but Moringa intrigued me with its fast-growing properties and apparently extreme nutrition. To say that it was "love at first bite" is an understatement. Moringa leaves are truly delicious, and I was hooked for life. The photo is mine, from one of our incredible Moringa trees. Just look at these beautiful bright green leaves, glistening with dewdrops like gemstones! Don't you think that is a lovely sight? All I can tell you is, the more I was exposed to Moringa - in any form - the more I loved it! Not only does it taste good, the plant itself is beautiful! The leaves are bright, intense green. The tiny flowers are delicate and profuse. The trees smell like roasted nuts. The buds and flowers are delicious - even though they should not be eaten raw, like the leaves can be. The pods are a conversation piece, and the young pods are edible. Chopped up Moringa branches, left over from harvesting the leaves, buds, and blossoms, and pods - make an excellent mulch I have not found any commercial mulch, to beat it. Talk about keeping down weeds! Moringa has become a part of my life, 'cause it smells good, looks good, tastes good, and is one extremely useful tropical tree! So,... I grow it.....harvest it.....promote it.....sell it.....eat it.....and love it! I have owned this book for many years, and enjoyed it thoroughly. If you live in an area where you can grow tropical plants, and love to plant edible landscaping, get a copy. I was delighted to see Moringa included in the text, and learned about many more plants with edible leaves that are incredibly nutritious, and extremely easy to grow. 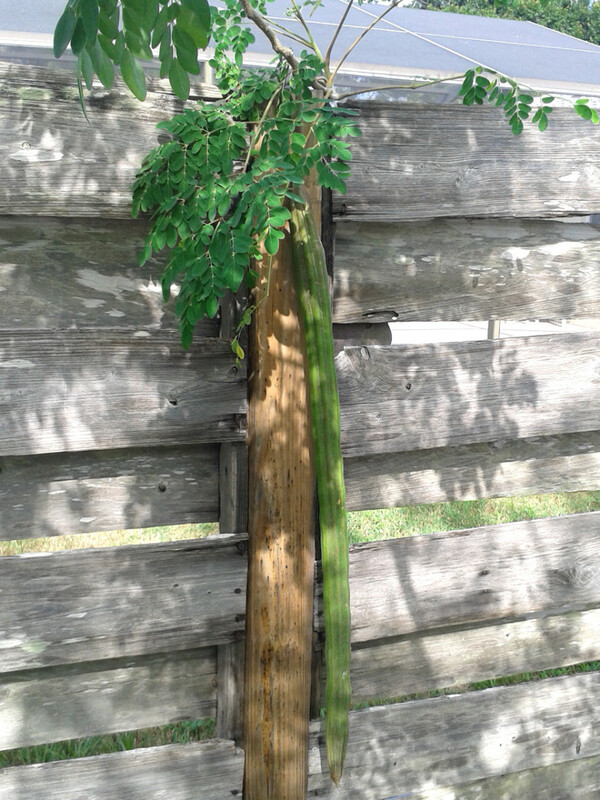 One Of Our Moringa Pods - Almost 4 feet long! The reasons are many - and I discover more of them weekly! You know, when you LOVE something, it is often difficult to say why, but Moringa makes it easy. Moringa is a fast growing plant. We have had some of our Moringa trees grow over 20 feet tall their first year! You can start to eat its leaves as early as three weeks from planting the seeds - but you won't get many that way! Moringa leaves are just delicious, right off the tree, raw- the best way to eat them! Their leaves grow "clean" and if I strip a lot of them off the branches, to eat in a meal, they require minimal rinsing. When I eat them right off the tree, I never rinse them at all! The nutrition God packed into Moringa leaves is legendary. Merely eating its leaves has been scientifically proven to dramatically affect one's health, and I have seen some incredible results from eating it, in my own body. 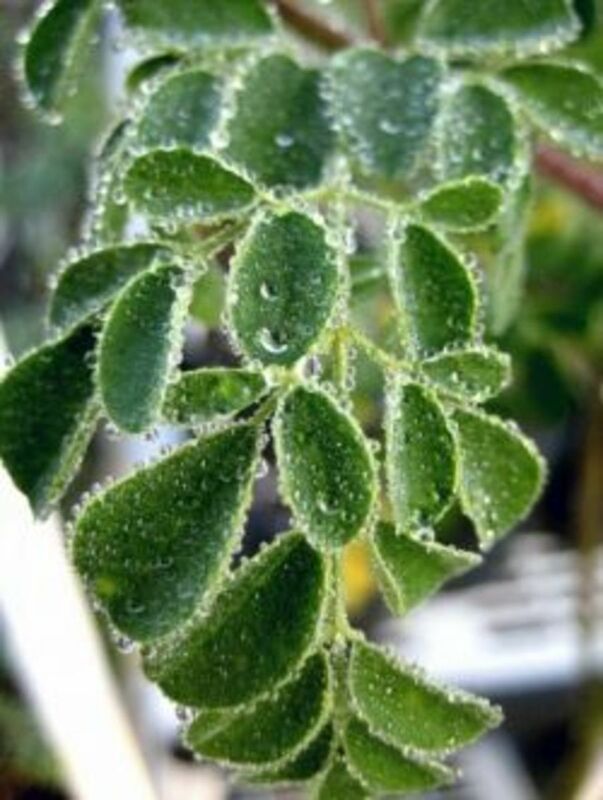 Moringa can be grown as an annual in cold climates. or as a perennial in warm ones. Being a heat-loving tree, Moringa doesn't like cold temperatures, at all. My Moringa Oleiferas and Moringa Stenopetalas should really not still be alive, after this last cold winter, but - they live! There are so many other things that I love about Moringa, but the main thing is that you can help others get extreme nutrition into their bodies, with a humble, incredible tree - that is safe for infants and adults, alike! It is so easy to grow, even a child can do it, and it is a LOT of fun for them to see how fast it grows! Moringa leaves are easier to prepare than just about any green I've eaten, and the pods are edible, the flowers buds are edible, the flowers are edible, and the seeds are edible. Moringa can be incorporated into the natural landscaping of any hot climate, and it is especially beneficial to many poverty-stricken nations, to combat malnutrition. A little Moringa - goes a LONG way! So,... I'll let you do some investigating on your own, as the Moringa tree has people who passionately love it, all over the world! We have only cited TEN REASONS WHY WE LOVE MORINGA, when there are actually hundreds, but it's hard to swallow a whole meal at one time - besides, would you really want to read through a whole page filled with reasons we love Moringa? The Moringa Book I Loan Out The Most! If you are attempting to educate someone about Moringa, this book is one of the best to whet their appetite. I keep a copy at our business, and I cannot tell you how many times I have loaned it out to our customers. It is easy to read and understand, and explains Moringa "in a nutshell". 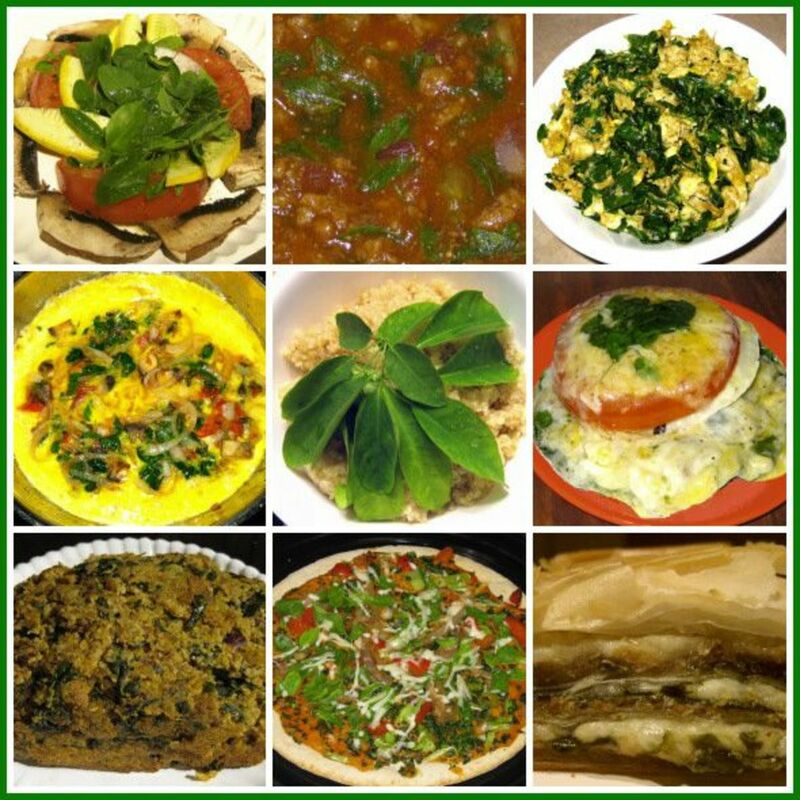 Here are just a few dishes that I have made with Moringa. Believe me, there are many, many more. I had to laugh, at how one of my grown daughters reacted, when she saw the photos. She said - "Dang, Mom! You MADE all those dishes? I didn't know you knew how to cook!" Her remark was occasioned by the fact that I have been so busy at my business, for the last 13 years, that the meals at home were sketchy, to say the least. Top row, we have a Portabello Mushroom and Moringa Salad, followed by Moringa Chili, and Scrambled Eggs with Moringa. Center row, from left to right, is our Moringa Omelette, Quinoa and Moringa Stenopetala, and Portabello Mushroom, Tomato, Onion, and Cheese Moringa Tower. Bottom row, features: Moringa Leaf Loaf, Wholegrain Moringa Pizza, and Moringa Phyllo Squares. The dishes were all made by me, and seemed to please everyone who sampled them. The photos were all taken by me, too, in my own kitchen. There are so many creative ways to eat Moringa leaves, and we have also enjoyed Moringa Dill Fresco Quiche, Moringa Artichoke Spinach Dip, and Sautéed Moringa with Garlic. Now matter how we eat Moringa, we enjoy it every time. I'm sure you will find lots of ways to incorporate this tasty, nutritious leaf into your diet, that I haven't even imagined! The authors teamed up with the World Outreach Program Foundation from Kansas, to write this little 80-page book full of nutritious recipes made with the bounty of the Moringa tree. It was published in 2013, so it is not yet very well known, but the recipes are simple, and easy to follow. More "MoringaMania" - and some photos to view. Because the Moringa Tree is such a fun tree to grow, and a valuable tree to grow, mainly for your health, that is - we talk about it a LOT! Here are a few places that you can read more about the "drumstick tree", or the "horseradish tree", as it is also commonly called. If you are fortunate enough to live where the ground never freezes hard, you can grow them, and eat from them - year-round. In a nutshell, a short article on how to incorporate Moringa into your daily diet, to benefit from its remarkable health-promoting qualities. This article will only take a few minutes to read, but will provide you with a wealth of information. Here's How to Make Those Trees Produce! So, how do you get a Moringa tree to produce leaves, really fast? You PRUNE them - over and over again. Here's an article we wrote, just to show you how to do it properly, to insure a bountiful harvest of leaves, and sturdy, bushy Moringa trees. There IS a solution to the worldwide tragedy of malnutrition. Moringa can be utilized in many ways, to combat hunger, feed the needy, and teach people in underdeveloped countries how to sustain themselves. Fight malnutrition with the Moringa tree! You are sure to enjoy the full-color photos in this "textbook" about Moringa. Not everyone wants to read about edible plants in such depth, but I do! The book is a bit more expensive than most of the Moringa books, but if you intend to delve into Moringa with more than a passing interest, you will be glad you own it. If you love Moringa, or just heard about it for the first time, or grow it yourself, or whatever...tell us! We love to hear from you, and I am just about convinced our trees grow stronger and faster every time they are praised! I do believe Moringa grows in your country. If you check, you should be able to find it. 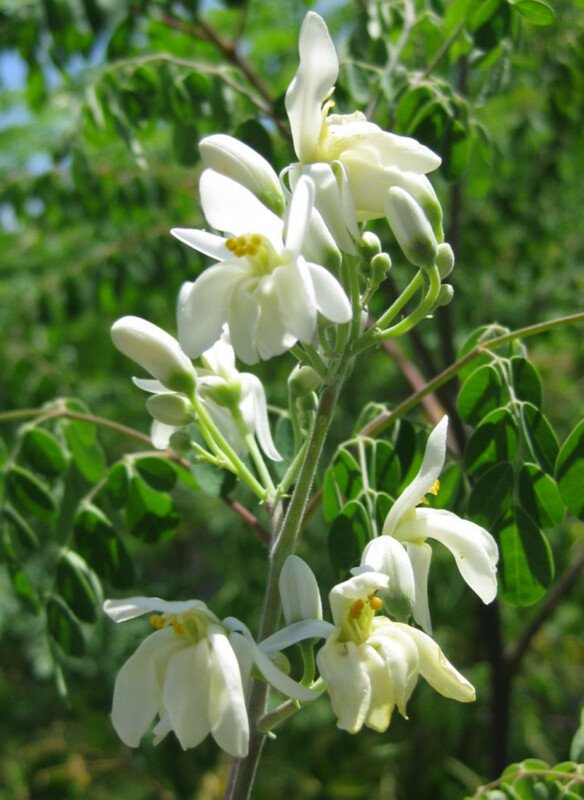 Renata, many people, all over the world have been benefited by the bounty from the Moringa tree. It is readily available in many places in Africa, already. There have been quite a few programs aired on the radio already, about its extensive nutritional properties. It grows freely in Haiti, Indian, Sri Lanka, Panama, Guatemala, and many other countries. Moringa is definitely a valuable plant, when it comes to malnutrition. Moringa could safe million South Africans if is atllaabiiivy can become accessible to everyone.Is it possible therefore that Mavis Mathabatha be given a show on the radio or tv channel to share this God send miracle tree with everyone interested.A million of SA's nutrition and health sufficience can be boasted by this miracle tree/plant. moringa was introduced to me August this year.Really, it is a very nice one because since I started eating it,my skin look no longer dry and i am healthier. Very nice lens, great job! It would not have happened, nor would I have believed it. Me, a 59 year old Dutch Businessman: who has been working on sustainable agriculture, on and off in West Africa for number of years. Some months ago in Sierra Leone I met a man the natives call Dr. Moringa. He explained to me all the good of the Moringa tree and convinced me to try his pure organic green powder, what I did. 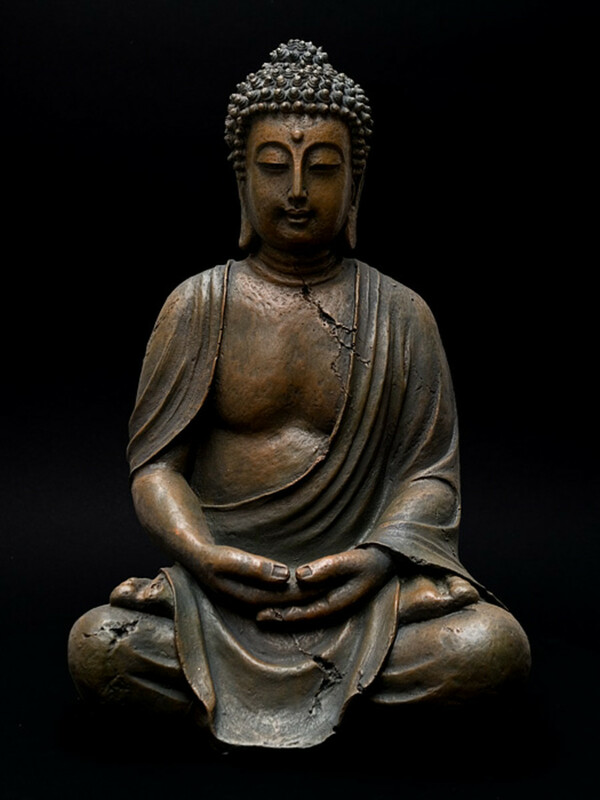 Through the years my physical condition slowly went down and when climbing the stairs I was exhausted. After three weeks I felt reborn- 10 years younger and full of energy. Even my sight improved dramatically. I had never heard of Moringa before, but now I'm really interested to try it! 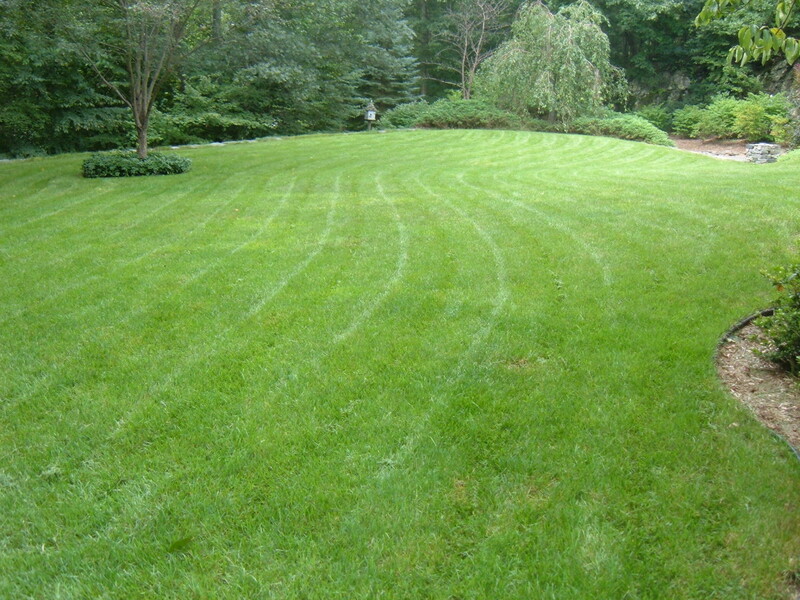 Unfortunately we get cold winters here, but maybe I can try to grow it in the summer. I had my first taste of "drumstick" in India this year, and I am sold on the stuff. MY question is " how could anything so good, grow on a tree. Not knowing all about this wonder food, I did a little research and BANG. It was like fireworks. Then my friend Afua,who just came back from Ghana has educated me some more about "Moringa" I just got to get some seeds for my garden in the spring. I cannot wait to experience the taste once more.Knowledge is power. I will be sharing this site and the information. So interesting, I've never heard of Moringa. 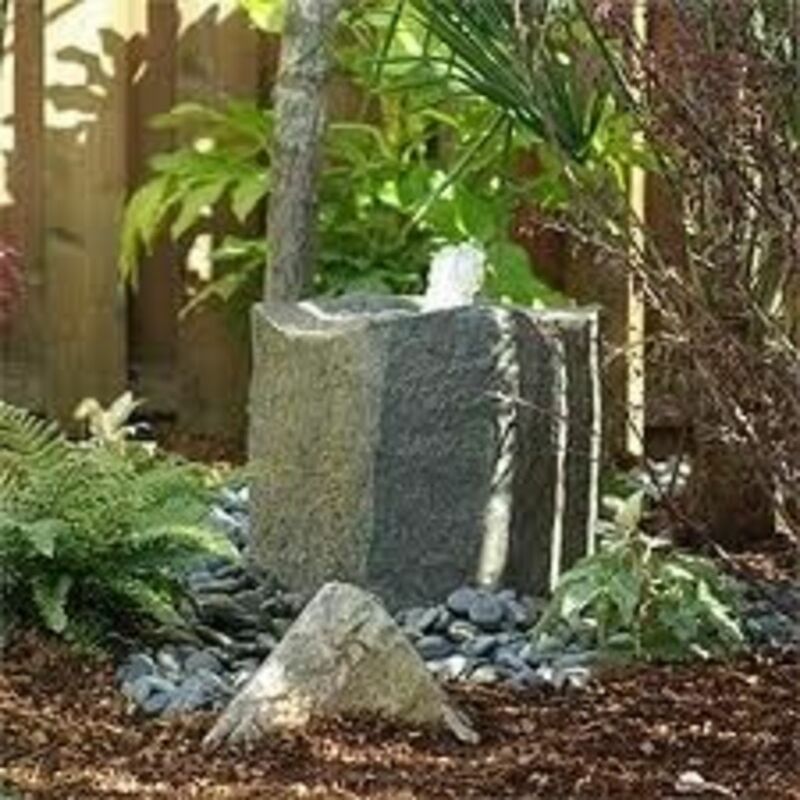 I enjoy having an edible landscape, so I may have to give this a try as an annual in my Ohio garden. I grow my own and add it to my food, its pretty good. @LadyFlashman: Thank you! Glad you came, and there's more on this particular tree that I love - hope you grow to love it, too! I have never heard of Moringa before! I was reading your orchid lens and then came across this, its very interesting.